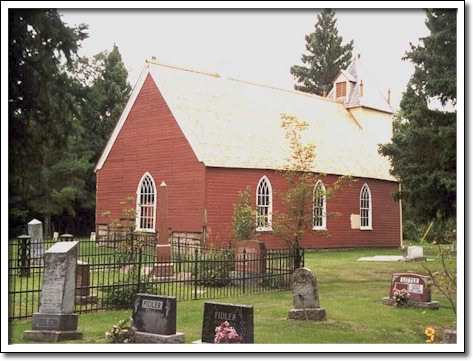 St. Anne’s, completed in 1864, is one of the oldest log churches in continuous use in Western Canada. Built through the efforts of Archdeacon William Cockran, founder of the Church of England Missions in the Assiniboine Valley, its first incumbent was Reverend John Chapman. Before St. Anne’s was built, settlers who had migrated from the parishes of St. Andrew’s, St. Paul’s, and St. James’ on the Red and lower Assiniboine Rivers, worshipped in Portage la Prairie or in farm houses in this district. The church is one of a handful of remaining buildings constructed of logs according to the technique known as Red River frame. That procedure was once the most common building technology in Manitoba. It involves the creation of a framework of vertical logs and then the placement of short horizontal logs into the spaces.